What is Setbacks, Front Yard or Ground Level? 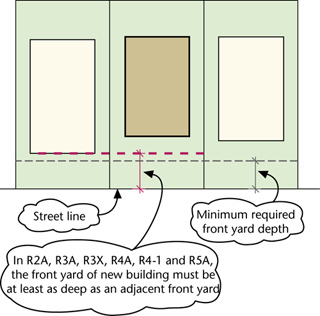 In R2A, R3A, R3X, R4A, R4-1 and R5A districts, if the adjacent front yards are deeper than the minimum required front yard, a new building must provide a front yard at least as deep as one of the adjacent yards, but it need not be deeper than 20 feet. 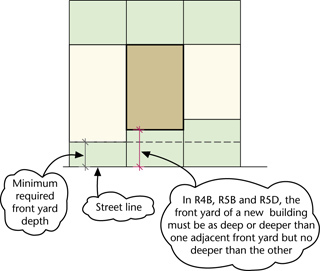 In R4B, R5B and R5D districts, if the adjacent front yards are deeper than the minimum required front yard, then the front yard of a new building must be at least as deep as one adjacent front yard and no deeper than the other, but it need not be deeper than 20 feet. 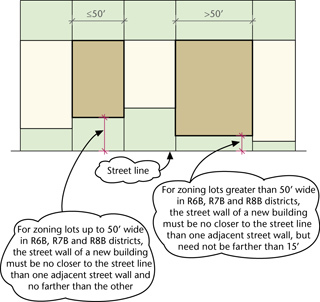 In R6B, R7B and R8B districts, the street wall of a new building, on any lot up to 50 feet wide, must be as deep as one adjacent wall and no deeper than the other. On lots wider than 50 feet, the street wall of a new build­ing may be no closer to the street line than the street wall of an adjacent building. A street wall need not be located farther from the street line than 15 feet. 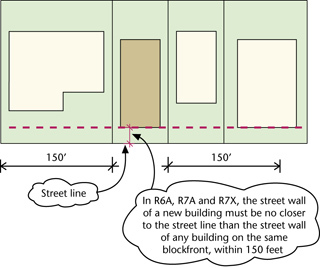 In R6A, R7A, 7D and R7X districts, the street wall of a new building may be located no closer to the street line than the street wall of any building within 150 feet on the same blockfront, but need not be located farther from the street line than 15 feet.